A remark Czech president Miloš Zeman made to Russian President Vladimir Putin at a press conference in Bejing Sunday, has since drawn sharp criticism from both the Czech foreign minister and legions of social media users. 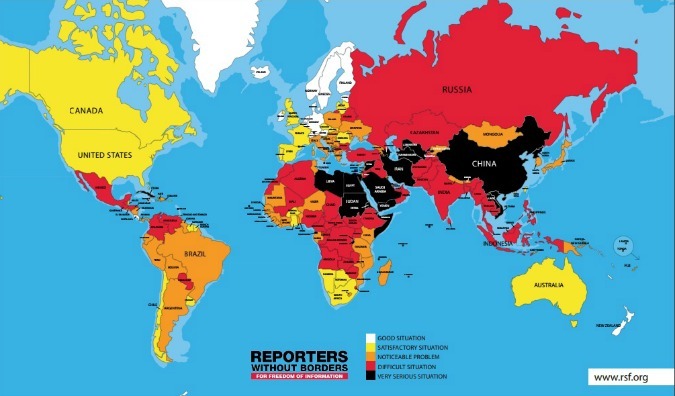 The time of the comment was unfortunate as it seems to underscore the findings of the 2017 World Press Freedom Index, released last month, in which the Czech Republic slipped in the rankings. The index, compiled by Reporters Without Borders (RSF), a network of correspondents in 130 countries advocating media freedom around the world, dropped the Czech Republic two points from 23 to 21 this year, citing the rise of oligarchs for the country’s decreased standing. The scrutiny of the mogul’s role in government has also reached critical levels, causing Czech Prime Minister Bohuslav Sobotka to announce the resignation of his cabinet over the business dealings of his political rival. The US ranks #43, down two positions from 2016; the UK ranks #40 down from 38 in 2016. Of the 180 countries listed, North Korea came in last. Break-Neck Speeds, Extreme Snow: Czech Car Skiing, Anyone?